The Greenville Swamp Rabbits overcame a good performance by St. Louis center fielder Mike Hill to knock off St. Louis, 8-6, at Michigan & Trumbull. Hill was 4 for 5 with a home run and 3 singles, while scoring 2 runs and driving in 2. Greenville starter Stanley Inman was credited with the win after throwing 117 pitches over 7.2 innings. His record now stands at 7-4. Walt MacKey notched his 19th save in 19 chances. Robert Moore, who is tied for 3rd in the CL in home runs with 16, chipped in for Greenville with a grand slam home run in the bottom of the second. 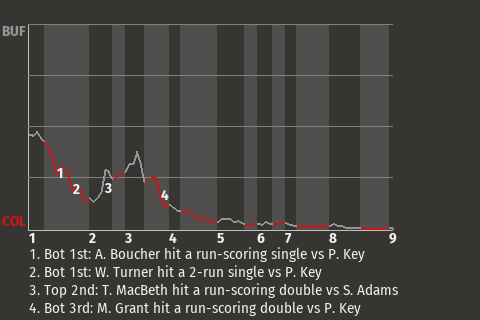 For the game, the designated hitter had 2 hits in 5 at-bats with 1 home run, 1 single, 1 run scored, and 4 RBI. "We came in and got the job done. That's what it's all about in this business," said Moore. The Swamp Rabbits improved to 38-32. Special Notes: 2B Jes�s Ramos was injured while running the bases.